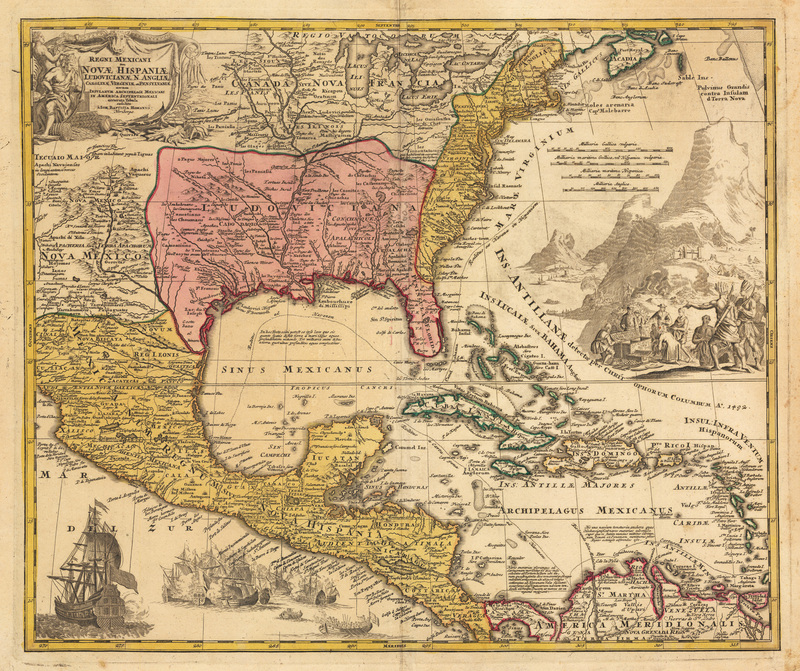 This beautifully engraved map by Johann Baptist Homann is one of the most influential and detailed early 18th century maps of the North America, the Mississippi Valley, Caribbean, and Mexico. It was made to illustrate the gold routes of the Spanish during their plunder of the Inca and Aztec Empires. The large vignette in the Atlantic portion of the map depicts a large gold mine operation with the natives filling a chest for the Europeans with the riches of their land. In the bottom left of the map is a fierce battle scene between many ships. The political divisions of North America are well defined for the period as they reflect the Treaty of Utrecht in 1713 and French expansion into Louisiana the following 10 years. The border of Carolina is shown extending almost to St. Augustine (the scene of many battles) and all the British colonies are shown confined east of the Appalachians. Condition: This map is in A condition with some light color offsetting and minor staining and foxing confined to the margins.